The 48m steel and aluminium displacement yacht Andiamo made her international premiere in Cannes last year, where she snapped up a World Yachts Trophies award. She is also a finalist for the Boat International Design Awards and the World Superyacht Awards. The name Andiamo (‘Let’s go’) could not be more apt for a custom yacht designed to meet the specific needs of her owner and his family for a comfortable, long-range vessel with good charter potential. Following a summer season in the Mediterranean, she debuted at the Cannes Yachting Festival, where her expansive exterior and interior arrangement won her the award for Best Layout. “We worked closely with the owner to deliver the yacht he has always wished for,” says Baglietto CEO, Michele Gavino. 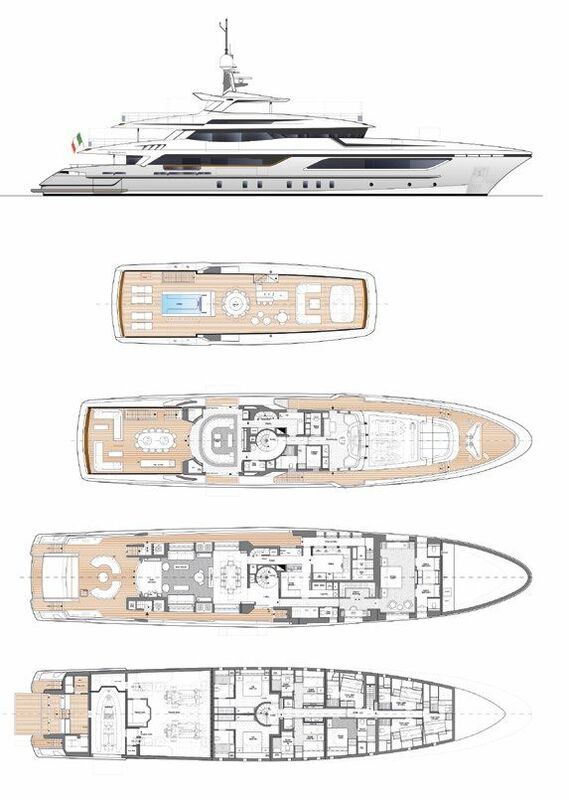 “The amazing living spaces and the six-cabin layout – unusual on this size of yacht – makes her the perfect vessel for long cruises with family and friends.” The exterior design by Francesco Paszkowski is an update of the traditional styling of Baglietto displacement yachts with a reversed wheelhouse windscreen to increase visibility from the bridge, and a garage athwartships aft that houses a 6m tender. While remaining below the 500Gt threshold, the longer hull length provides even more onboard comfort and liveability with a generous 340 sqm of space devoted to owner and guests. The six-cabin layout was a specific request of the owner, but another requirement was convivial outside areas suited to an open-air lifestyle at sea. On the sundeck, for example, there is a bespoke infinity pool with waterfall feature, dining facilities with bar, barbecue and grill, and sunbathing areas both forward and aft. There is another shaded dining area on the upper deck aft, and fold-down terraces that open onto the sea on both sides of the cinema room on the same deck level that are large enough for a couple of director’s chairs. Not forgetting the comfy conversation zone on the main deck aft, transom platform and beach club equipped with bar and shower. Inside, the full-beam master stateroom is located forward on the main deck and includes a walk-in wardrobe and His and Hers bathrooms. The lower deck is dedicated to the guest accommodation with two VIP suites, one double cabin and two twin cabins with Pullman berths, plus independent quarters for up to eight crew (the captain’s cabin is located on the bridge deck). The interior design, also by Paszkowski in collaboration with Margherita Casprini, draws on a sophisticated pallet of pale onyx and glossy ebony throughout for a modern-classic feel. The warm, dark-wood panelling in the main salon, for example, is subtly contrasted with the clear onyx flooring, café au lait carpeting and upholstery, and white lacquered surfaces. A backlit onyx wall further illuminates this light and airy space, and all the interior furniture was designed expressly for the owner. 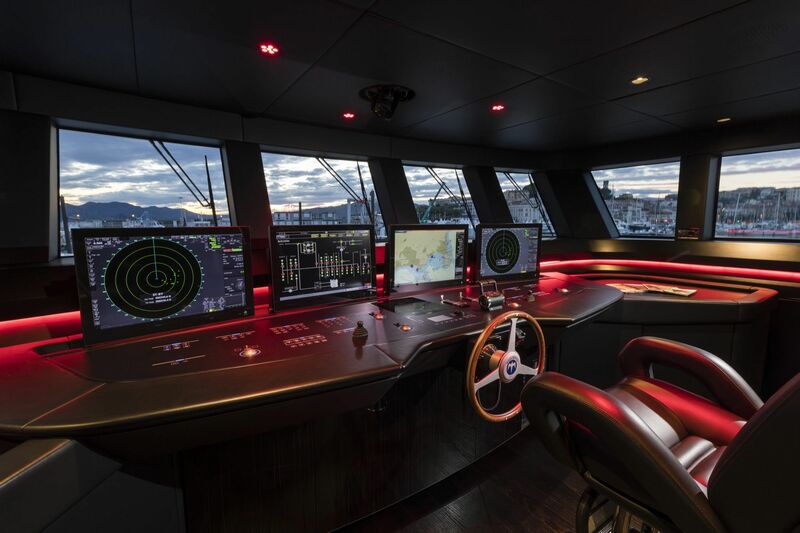 The wheelhouse is fitted with a fully integrated bridge system supplied by Telemar with a state-of-the-art foil panel that links the various functions by fibre optics. 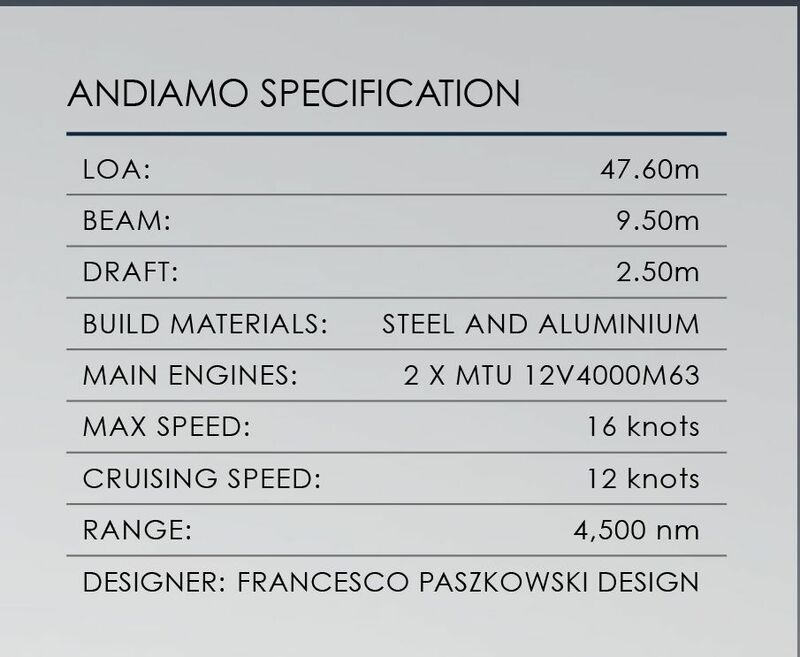 Built to the highest class of Lloyds Register of Shipping and MCA compliant, Andiamo is powered by twin MTU 12V4000M63 (1,500kW) engines for a top speed of 16 knots and an oceanic range of 4,500nm at a cruising speed of 12 knots.